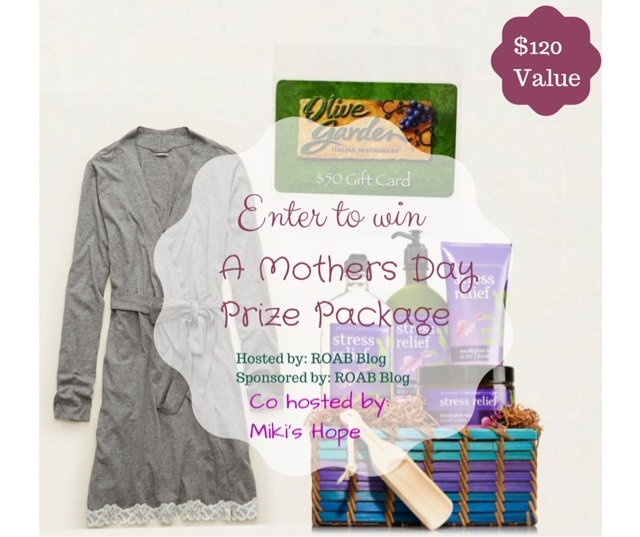 Thanks to all the fabulous bloggers and the wonderful co-host Miki’s Hope on helping to promote The Mothers Day Giveaway. 1 winner will win a prize package consisting of the following. 1 super comfy robe, spa prize gift basket from Bath & Body Works & a restaurant gift card of winners choice. Entrants must be 18+ and a resident of the US only to enter. Remember we “love it if you like us on Facebook” by doing so you are supporting our blogs! By supporting our blogs we can bring YOU many more FABULOUS giveaways! Good Luck & Thanks for stopping by! Reviews of a busy mom did not receive any type of compensation for this post. All entries are verified, One winner will be randomly selected by the giveaway tools form. Winner will have 24 hours to respond or another randomly selected winner will be chosen. None of the blogs mentioned or blogs promoting this giveaway are responsible for the prize or prize shipment. Prize will be mailed within 1-3 weeks. Please email me at reviewsofabusymom@yahoo.com if there are any questions. My mom is amazing she had 3 kids by the time she was 18 and is always loving and supportive. My mom was a wonderful human being, however, she’s passed away. But my mother in law is great! She loves me no matter what! I love my mom’s caring heart. She is always there for everybody else and she sometimes forgets about herself. She is always putting everyone first and I would love to put her first for once. My mom has given me my love for reading! The best thing about my mom is her coming out to help me since I just gave birth to our first child a couple weeks ago! The thing that I am most hoping to receive this Mother’s Day is freedom from responsibility. I support our entire family of five (as my husband is unemployed), and I am also responsible for keeping the house clean and for doing all the laundry. So I would like one day in which I don’t have to do ANYTHING. The best thing about my mom? Sheesh, that’s a hard one!! She’s my best friend, my confidant, etc. She makes me laugh like crazy, and she’s so much fun to hang out with. But she still plays the parent role. She is not one of those mothers who is the kid’s friend at the expense of being their parent. She encompasses both roles so well. What would I do without her?!?!?! The best thing about my Mom is that she is my best friend. She is there for me no matter what. Well truthfully I was just hoping to go out to eat. After seeing this though, I want this for Mother’s Day! Out to Eat, Robe and more wow! You guys are great! My mother is the most unselfish, loving and compassionate person I know. All I want for Mothers Day is to have all my kids together.